Macroglossa affinis Bremer, 1861, Bull. Acad. imp. Sci. St Pétersb. 3: 475. 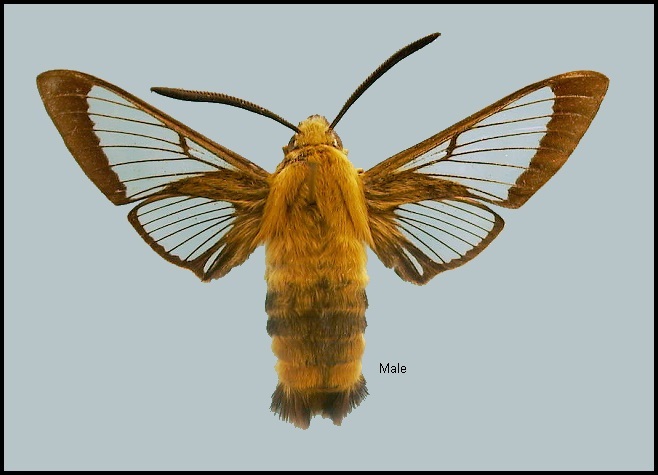 Type locality: [Russia, Khabarovskiy Kray] Ussuri, <<between the mouth of the Ussuri river and the Noor [He] river>>. Synonym. Macroglossa affinis Bremer, 1861. Synonym. Macroglossa sieboldi Boisduval, 1869. Synonym. 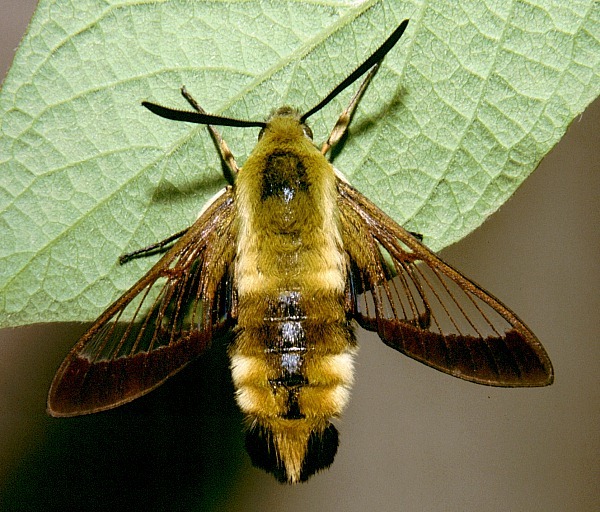 Sesia alternata Butler, 1874. Synonym. Sesia whitelyi Butler, 1874. Synonym. Macroglossa ganssuensis Grum-Grshimailo, 1891. Synonym. Macroglossa confinis Staudinger, 1892. Wingspan: 43-54mm. 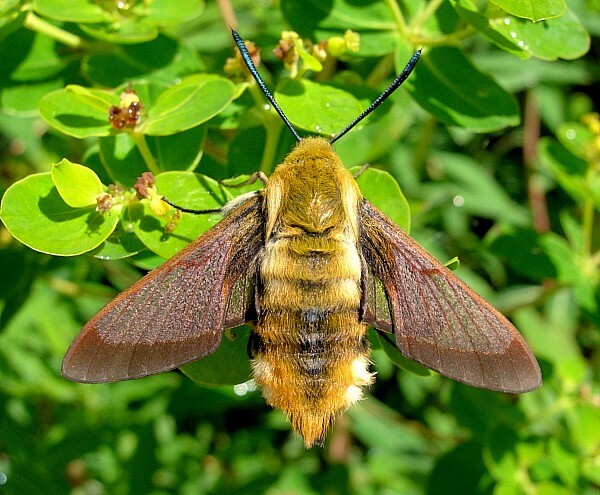 Very similar to Hemaris fuciformis but distinguishable by the darker wing borders, thinner scaling on the apical crossveins of the forewing cell and the conspicuous pale margin to the thorax. 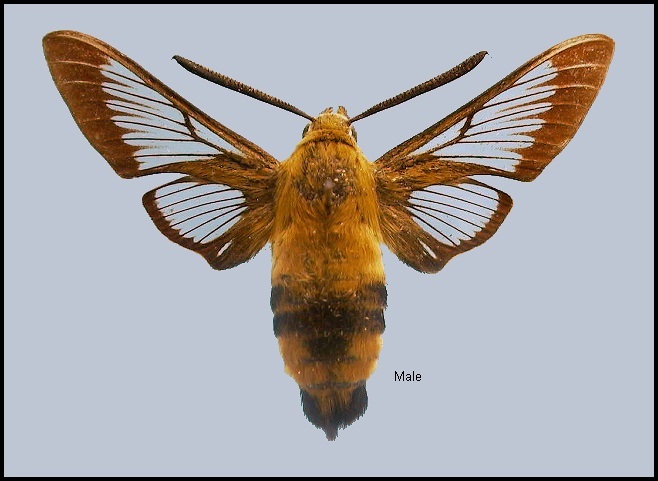 As with all other members of this genus, the adult emerges from the pupa with wings fully scaled. 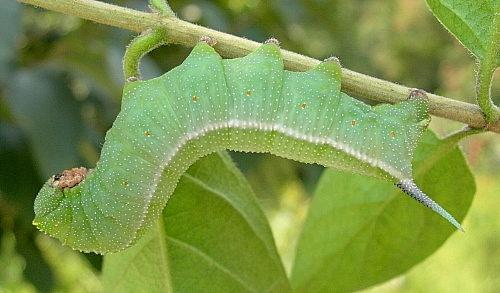 The hyaline areas only appear after the first flight after the scales are shed. 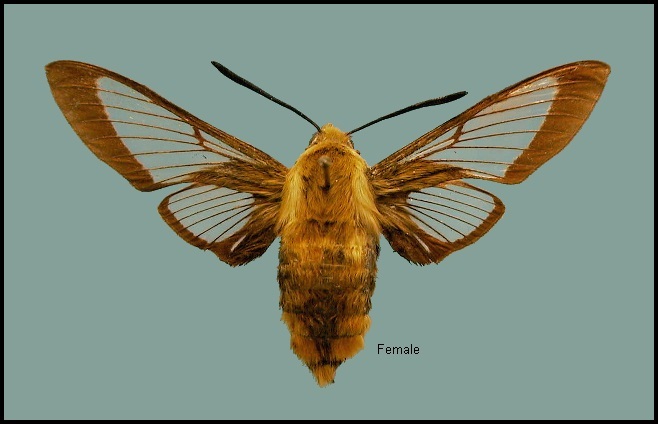 In the male genitalia, aedeagus processes longer than in Hemaris fuciformis and not quite so broad. A woodland species, but preferring the margins and clearings along rivulets, where it flies all day (Izerskiy, 1999b; Dubatolov, pers. comm. 2010); here, they often drink from the waters' surface during flight (Dubatolov, pers. comm. 2010). 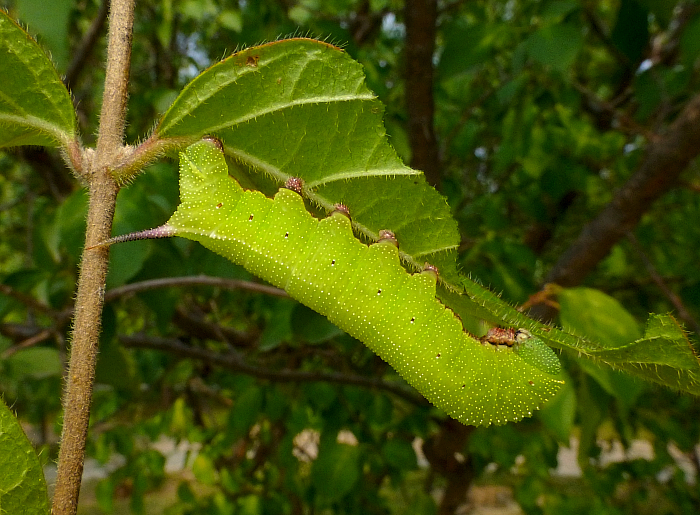 However, this species has adapted well to the bigger parks and gardens of Beijing, where it can be found breeding in the shrubberies under trees (Pittaway, pers. obs. 2003). China: iv (Beijing; Shandong); v (Gansu); vi (Jiangsu; Sichuan); vii (Chongqing; Gansu; Hubei; Heilongjiang); vii-viii (Shandong); viii (Zhejiang); 2.ix (Beijing). Taiwan: v ([unstated locality]); vi (Nantou Hsien). Japan: iv-viii (Honshu); 4.vi-23.viii (Hokkaido). Russia: 25.v-26.vii (Khabarovskiy Kray); 5.vi-15.vii (Primorskiy Kray); 3.viii (Primorskiy Kray). In northern China there are two generations per year, with adults flying between May and late August (Yang, 1978). Park et al. (1999) give early May until early November as the flight period in Korea. Found under the terminal twigs of mid-level branches 0.5-1.5m off the ground, never those on top of a shrub. Common in and around Beijing on ornamental shrubs of Lonicera maackii during late August/September and into October (Pittaway, pers. obs. 2003 & 2013). 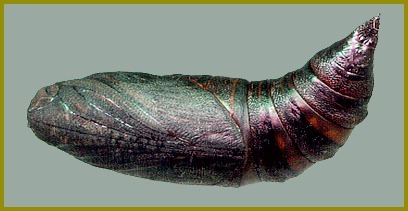 PUPA: 33mm. Very dark brown, almost black, but mahogany brown between the abdominal segments; tapering caudad from a forward projecting head. Head not tuberculate, but with two small downward-pointing sharp hooks frontad. 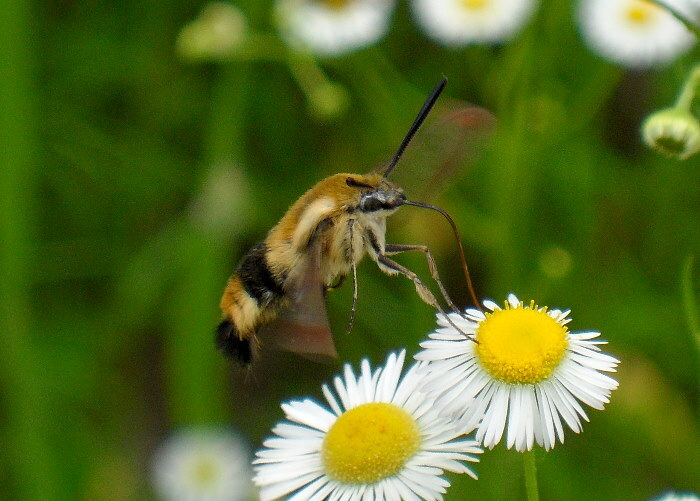 Proboscis not produced and lying flush with and between the slightly carinate wing-cases. Wings and abdominal segments very finely punctate so as to tone down the gloss. Cremaster broadly triangular, dorso-ventrally flatted, with a sharp point; tuberculate. Formed in a loose brown cocoon among debris on the soil. The overwintering stage. Larval hostplants. Chistyakov & Belyaev (1984) give Lonicera maackii for the Russian Far East. This is also the main host in the gardens of Beijing (Pittaway, pers. obs. 2003). Recorded in Korea on Lonicera japonica and Patrinia scabiosaefolia (Valerinaceae) (Park et al., 1999). 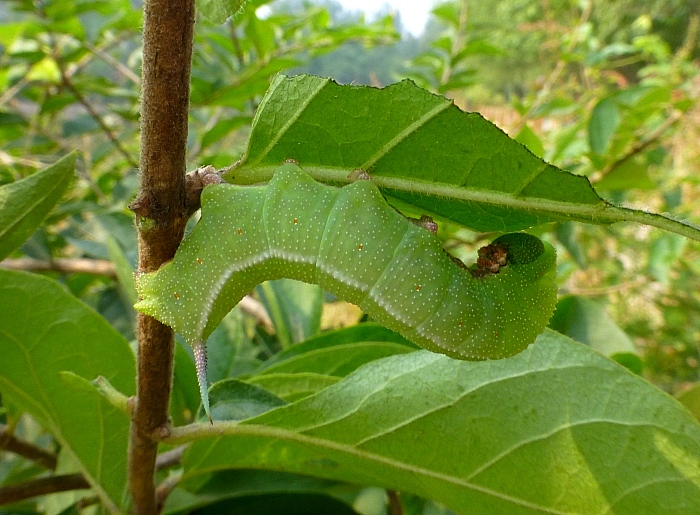 Will investigate and lay eggs on Symphoricarpos in gardens (Pittaway, pers. obs. 2005). China: Heilongjiang; Liaoning (Shenyang); Bejing (Haidian; Xiangshan; Botanical Garden; Baihua Shan); Tianjin; Shandong (Yantai; Qingdao); Qinghai (Xining); Gansu (nr. Min Xian, 3200m; Maijishan, 1500m); Jiangsu (Nanking); Anhui (Mt. Huang Shan); Zhejiang (Tianmu Shan; Mogan Shan); Hubei (Changyang); Sichuan (Zhongjiang); Chongqing (Jinfo Shan); south Xizang/Tibet (Bomi, 2750m); Fujian (Liufang); Hong Kong. Taiwan: Nantou Hsien (Jinyüeh Tan). North Korea: Kangwon Prov. (Daeseong-san); South Hamgyong Prov. (Wonsan); North Hamgyong Prov. (Musan). South Korea: Seoul; Bukhan-san); Kyonggi Prov. (Dobong-san; Suri-san; Gwangleung; Imjingak; Chukryong-san; Aeng-mubong; Cheonma-san; Paldang; Soyo-san; Mugab-san; Myungji-san); Kangwon Prov. (Seolak-san; Odae-san; Yangyang; Balwang-san; Chiak-san; Chuncheon; Hoenggye; Oksu Temple; Baeduk-san; Palbong-san; Sangyong); South Chungchong Prov. (Gyeryong-san); North Cholla Prov. (Jiri-san; Naejang-san; Namwon); South Cholla Prov. (Mudeung-san; Wolchul-san; Baekun-san; Jogye-san; Seonam Temple; Jin-do; Wan-do); North Kyongsang Prov. (Sobaek-san; Dalseong; Youngyang; Geumleung; Mungyang; Andong; Ulleung-do; Uiseong); South Kyongsang Prov. (Pusan; Geumjung-san; Geoje-do; Namhae; Sancheong; Ulsan; Jinju; Hadong); Cheju Prov. (Ara-dong; Ora-dong; Mokseokwon; Bijarim; Sunheul; Topyung; Susan-ri; Suakbong; Ipseok-dong; Andeok; Gwaneum Temple; Sungpanak). Japan: Hokkaido (Hakodate; Kushiro; Tokachi); Honshu (Chichibu; Kami-yoshida; Oiwake; Tokei-ji; Gifu; Nikko; Karuizawa; Hoshikawa; Tokyo; Yokohama; Mt Tsurugi; Mt Asama; Nakauonuma; Mt Mitsumine; Mt Iwamuro); Shikoku; Kyushu; Ryukyu Archipelago (Okinawa). 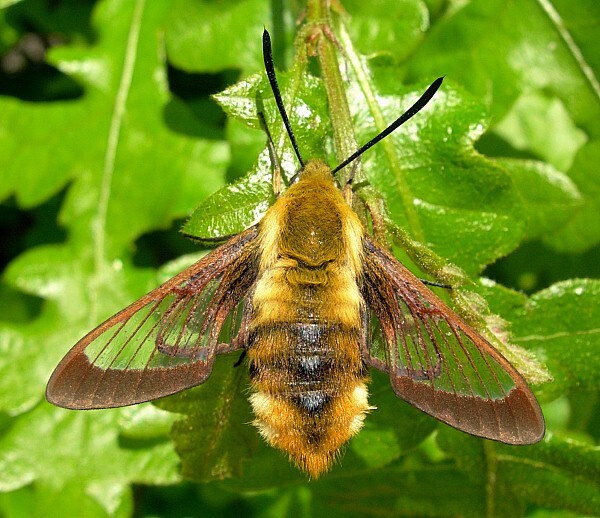 Russia: Southern Amurskaya (Uril; Pashkovo); Yevreyskaya (Obluch'e; Bastak); Khabarovskiy Kray (Bolshekhekhtsyrskii Nature Reserve, Khabarovsk suburbs; Slavyanka; Komsomol'sk-na-Amur; Pivan; Kiselevka; Arkhangelskoe; Botchinskii Nature Reserve); Primorskiy Kray (Khasan; Narva; Askold Island; Vladivostok; gora Tsamo-Dynza; gora Chernaya, 1100m; Partizansk; Tigrovoy; Anisimovka; Ussuriysk; Vinogradovka; Barabash-Levada; Ryazanovka; Kedrovaya Pad Nature Reserve; Anuchino; near Kalinovka; near Zanadvorovka); Sakhalin Island; Kurile Islands (Kunashir Island). Mongolia, Russian Far East, northern, central and eastern China, Taiwan, North Korea, South Korea, and Japan.